In our newly expanded Bell-Man Cart category, you will find hotel luggage carts, from many different manufacturers, suited for any budget. Of specific interest is our "Design Your Own Bell-Man Cart" where you can do just that! You choose the piping style, platform size, carpet color, wheels and more. Exclusively available only at Handtrucks2go.com! Watch the Customized Bellman Cart Video Here. Bell carts are also called luggage carts. They are ideal for hotels, motels, college dorms, condos, beach or others and apartments. Handtrucks2go.com has the perfect bellman cart for the building it needs to service. FREE SHIPPING for every order so why pay extra money for shipping? It’s easy to shop by these Manufacturers: Glaro, Monarch Carts, Ex-cell and CSL. The Economy Bellman Cart model ranges in price from $500.00 to $1,000.00. One has green carpet with brass uprights. A best deal model is available. The Monarch Hotel Luggage Cart is gold colored and very nice. Do you prefer stainless steel? Handtrucks2go.com has an economy model of the sturdy stainless steel model, too. For more information, check the DETAILS link under each picture of the bellman carts sold on this website. If you have questions, please call our Customer Service desk where our well trained, friendly associates can help answer those questions. The Mid-Range Bellman Cart model ranges in price from $1,000.00 to $2,000.00. 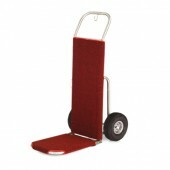 Handtrucks2go.com offers the option to design your own bellman cart. There are five (5) tube styles and thirty two (32) finishes available. These can be ordered online or you can call our Customer Service Desk. We’re here to help you choose everything needed to coordinate your Bellman Cart with the color scheme of the building, accessories and finishes! The Glaro Ballcrown Bell Man Cart comes in three (3) sizes with thirty two (32) finishes. For more information about the Glaro Ball crown Bell Man Cart, click on the DETAILS link. Don’t forget the FREE SHIPPING! Glaro PREMIUM Bell Man Cart is available in two (2) sizes and thirty two (32) finishes with FREE SHIPPING! Check out the three (3) additional models that are available in the mid-range prices on Handtrucks2go.com. The High Price Bellman Carts are priced from $2,000.00 to $3,000.00. 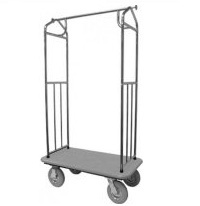 Coming soon to Handtrucks2go.com is a multi-shelf model Bellman Cart made specifically for condominiums. These are great for the city condominium, the beach condominium or the ski lodge. The uses are pretty much limitless for moving luggage and/or equipment. Are you looking for a carpeted Luggage Hand Truck? Check back soon for the new models that will be offered on this website! Finally, do you need a Luggage Platform Truck that is economical but perfect for an office, a hotel lobby, an airport, a school or church? The models sold by Handtrucks2go.com are durable and strong enough for demanding industrial areas. It is easy to operate, flat, made of steel and a carpeted plywood base. It has four wheels and can carry multiple pieces of luggage, files, computers, office equipment, chairs, etc. Are you ready to order? It’s easy to do online or by calling us! 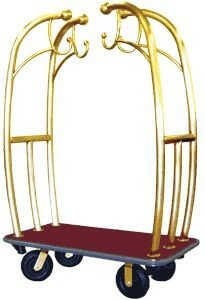 Get your customized Bellman Cart today at Handtrucks2go.com!